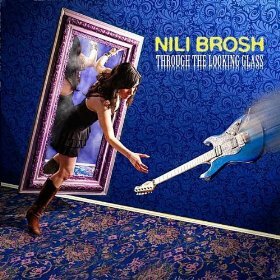 Boston-based guitarist Nili Brosh is set to release her debut album Through the Looking Glass on November 16, 2010. Brosh is a graduate of the Berklee College of Music, where she has also taught classes in Berklee’s summer music program. At 20 years of age, she has accumulated quite a resume already, having worked with Guthrie Govan, Stu Hamm, and Andy Timmons. Timmons even appears as a guest soloist on Through the Looking Glass. Through the Looking Glass is a nine song instrumental rock guitar album featuring some excellent guitar playing by Brosh. The album starts with an atmospheric track called “The House of Tomorrow” that highlights Brosh’s melodic playing. The next track on the album is called “Lost in Suburbia”. This track is a progressive-sounding rock track that again highlights Brosh’s melodic guitar playing. “Hat Tricks” is a jazzy tune that starts off slow, but picks up steam about halfway through. This is a fairly complex song with Brosh really letting loose near the end of the song. Following “Hat Tricks” is a song called “High Strung”. This song is interesting in that it starts off fast and strong and then segues into a jazzy interlude followed by more intense playing. The title track starts off as a slow ballad-style song, but quickly morphs into a power ballad with some very nice melodic playing by Brosh. I like how this song, like several others on the album, change tempo several times throughout the song. “Placebo” starts off as a straight-ahead instrumental rock song. But, about halfway through the song, she surprises the listener with a jazzy interlude followed by more uptempo rock playing. “Wafer” is an uptempo rock song with a guest appearance by Andy Timmons. This track reminded me a little of something Vai might play. Things get heavy on the song “Never Be Enough”, which features a driving rhythm in a double-time feel. Brosh’s solo on this track features some of the most fiery guitar work on the album. The album ends with a song called “Typsy Gypsy”. This is another uptempo rocker with shades of both Vai and Satriani. Like “Never Be Enough” before it, “Typsy Gypsy” features some fiery and inspired playing by Brosh. Not only does Brosh let it all out on this track, there’s even a bass solo. Hey Nili, good seeing you at NAMM.